Arusha Gallery is delighted to announce it will present a large new collection of works by British artist Charlotte Keates at PULSE Contemporary Art Fair, Miami Beach this December. 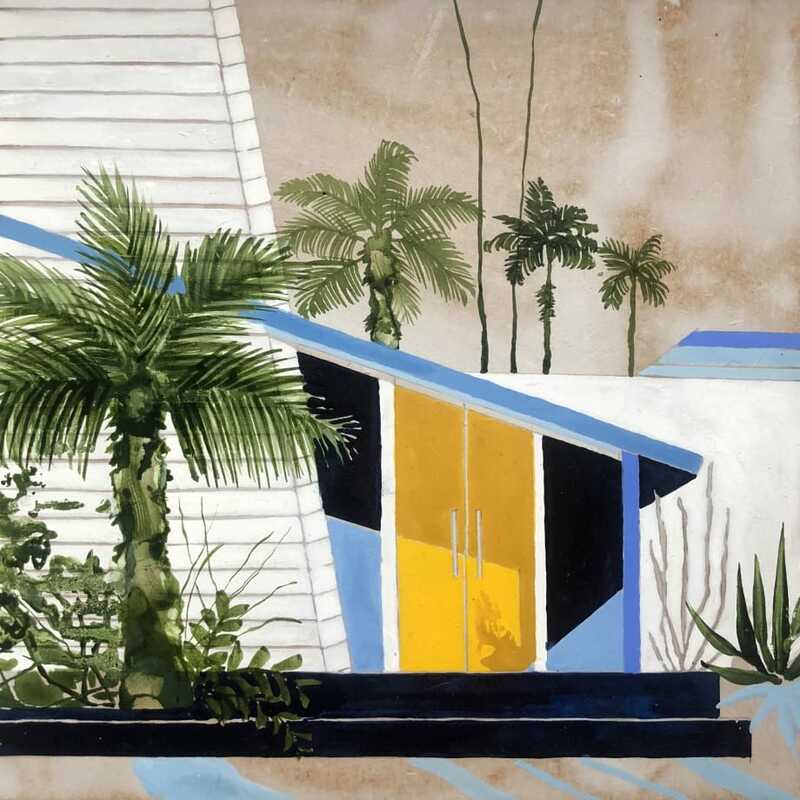 The Kennedy Trip will comprise nearly 50 vivid paintings of 1960s and 70s-inspired houses, lush palm trees and placid swimming pools — depictions loosely based on a set of Kodak slides documenting the holiday of an American family in the 1960s. Keates’s paintings echo the aesthetic of vintage Florida and California, with a nod to modern mid-century design and interiors. They range from small pieces to large diptychs (up to 2m wide) and are in high demand by worldwide collectors, frequently selling out at exhibitions and art fairs. This long-awaited showing at Miami PULSE will retain Keates’s trademark combination of delicate pencil lines, textural sections of heavily dabbed paint, and ﬂuid passages of loose brushstrokes. Inspiration for The Kennedy Trip came from a batch of 100 vintage Kodachrome slide photographs that Keates indirectly acquired from a wealthy American family, the Kennedys, who travelled extensively in the 1960s. Keates does not seek to closely imitate the spaces captured on ﬁlm and instead combines them with memories of her own travels through North America. She creates dream-like scenes through imagined perspective, evoking the likeness or feeling of a space rather than following logical architectural depictions. The title The Kennedy Trip comes from a handwritten inscription on one of the slides; the intriguing line is what triggered Keates’s original interest into the aesthetics of 1960s and 70s California, and speciﬁcally the desert resort city of Palm Springs, famous for its many examples of midcentury-modern architecture. In her paintings Keates reﬂects the city’s rich and opulent style, with depictions of private clubs and luxurious swimming pools that hint at the ‘good life’ prosperity of 1960s America. One work in particular, Everything Started With You, focuses on the pink tennis court, desert mountains and deep blue pool of the exclusive Palm Springs Racquet Club. A destination for Hollywood’s golden era, The Club is also the place where a 23-year-old Marilyn Monroe was discovered by photographer Bruno Bernard in now-famous photos of the young model on a diving board. Monroe later wrote to Bernard, “Remember Bernie, everything started with you”. Palm Springs is also one of the rumoured location for the supposed affair between Monroe and John F. Kennedy, further intertwining the wider connotations of the ‘Kennedy’ title and post-war America. Also part of The Kennedy Trip will be a grid of 36 smaller works (22 x 22 cm each) directly inspired by designer Kassia St Clair’s book The Secret Lives of Colours, which explore anecdotes behind speciﬁc shades and their cultural signiﬁcance. Keates used a colour or quotation from the book as starting point for each piece, choosing to push her artistic process with hues she had not previously worked with and did not feel naturally drawn to. The resulting brightly coloured vignettes feature similar mid-century inspiration and outlines of desert mountains, and are titled with Keates’s evocative style — for instance Absinth’s Ardent Lovers and Cornﬂower Blue at Dusk. The works show reﬂecting shadows of towering trees, embracing architectural lines under bright sunshine, and highlight the peaceful symbiosis between man-made buildings and natural environment. The captivating scenes recall the famous style of organic architects Frank Lloyd Wright (1867–1959) and Hugo Häring (1882–1958), whose innovative designs sought to integrate architectural structures within their surrounding landscape.